Morocco, being one of largest energy importer in MENA, is making concerted efforts to reduce its reliance on imported fossil fuels. Renewable energy is an attractive proposition as Morocco has almost complete dependence on imported energy carriers. In 2012, Morocco spent around US$10 billion on all energy imports (crude oil and oil products, coal, natural gas and electricity). Annual electricity consumption in Morocco was 33.5 TWh in 2014, and is steadily increasing at a rate of around 7 percent each year. The major sources of alternative energy in Morocco are solar and wind. Wind energy potential is excellent in vast parts in the northern and southern regions, with the annual average wind speed exceeding 9 m/s at 40 meters elevation. As far as solar is concerned, the country experiences 3000 hours per year of annual sunshine equivalent to 5.3 kWh/m²/day. In Morocco, the total installed renewable energy capacity (excluding hydropower) was approximately 787MW at the end of year 2015. The Moroccan Government has set up an ambitious target of meeting 42% of its energy requirements using renewable resources (2GW solar and 2GW wind) by 2020. Morocco is investing more than USD13 billion in developing its renewable energy sector, which will reduce its dependence on imported energy carriers to a great extent. Morocco has launched one of the world’s largest and most ambitious solar energy plan with investment of USD 9billion. The Moroccan Solar Plan is regarded as a milestone on the country’s path towards a secure and sustainable energy supply which is clean, green and affordable. The aim of the plan is to generate 2,000 megawatts (or 2 gigawatts) of solar power by the year 2020 by building mega-scale solar power projects at five location — Laayoune (Sahara), Boujdour (Western Sahara), Tarfaya (south of Agadir), Ain Beni Mathar (center) and Ouarzazate — with modern solar thermal, photovoltaic and concentrated solar power mechanisms. Morocco, the only African country to have a power cable link to Europe, is also a key player in Mediterranean Solar Plan and Desertec Industrial Initiative. Construction is underway at the 500MW Solar Power Complex at Ouarzazate, the world’s largest solar power plant. To be built with investment of an estimated Euros 2.3 billion, the project is the first one to be implemented under the Moroccan Solar Plan. The Ouarzazate Solar Complex, also known as Noor CSP with a total capacity of 580 MW will produce an estimated output of 1.2 TWh/year to meet power demand of more than 1 million population when it is completed in 2018. The first phase of Ouarzazate solar project, known as Noor 1 CSP, is a 160-MW concentrated solar power (CSP) plant which will be switched on in Febrary 2016. Around $3.9bn has been invested in the Ouarzazate solar complex, including $1bn from the German investment bank KfW, $596m from the European Investment Bank and $400m from the World Bank. 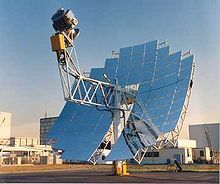 The Ain Beni Mather Integrated Solar Thermal Combined Cycle Power Station, commissioned in 2011, is one of the most promising solar power projects in Africa. The plant combines solar power and thermal power, and has the production capacity of 472 MWe. The total cost of the project was US$544 million including US$43.2 million in grant financing from the GEF, two loans from the African Development Bank (AfDB) for a total of US$371.8 million and a loan of US$ 129 million from Spain’s Instituto de Credito Official (ICO). In 2010, the Moroccan Agency for Solar Energy (MASEN), a public-private venture, was set up specifically to implement these projects. Its mandate is to implement the overall project and to coordinate and to supervise other activities related to this initiative. Stakeholders of the Agency include the Hassan II Fund For Economic & Social Development, Energetic Investment Company and the Office National de l’Electricité (ONE). The Solar Plan is backed by Germany, with funding being provided by German Environment Ministry (BMU) and KfW Entwicklungsbank while GIZ is engaged in skills and capacity-building for industry. Morocco has huge wind energy potential due to it 3,500 km coast line and average wind speeds between 6 and 11 m/s. Regions near the Atlantic coast, such as Essaouira, Tangier and Tetouan (with average annual average wind speeds between 9.5 and 11 m/s at 40 metres) and Tarfaya, Laayoune, Dakhla, and Taza (with annual average wind speed between 7.5 and 9.5 m/s at 40 metres) has excellent wind power potential. According to a study by CDER and GTZ, the total potential for wind power in Morocco is estimated at around 7,936 TWh per year, which would be equivalent to about 2,600 GW. Morocco’s total installed wind power capacity at the end of 2015 was an impressive 787MW. The first wind farm in Morocco was installed in 2000 with a capacity of 50.4 MW in El Koudia El Baida (Tlat Taghramt – Province of Tetouan), situated 17km from the town of Fnidek. The annual production of the project is around 200 GWh, accounting for 1% of the national annual electricity consumption. In 2007, 60MW Amogdoul wind farm, on Cap Sim south of Essaouira, came online. This wind farm was realized by the national utility ONE and is producing around 210 GWh/year. Another landmark project is 140 MW at Allak, El Haoud and Beni Mejmel, near Tangier and Tetouan which was commissioned in 2010 with annual production of 526 GWh per annum. 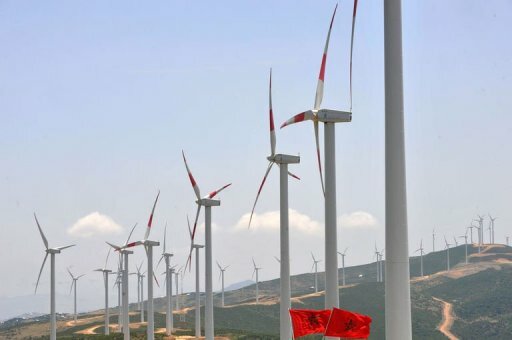 Morocco has a strong pipeline of wind power projects to realize its objective of 2GW of wind power by 2020. Africa’s largest windfarm, at Tarfaya in Southwestern Morocco, having installed capacity of 300MW become operational in 2014. The Tarfaya windfarm, built at a cost of around $700 million has 131 turbines will meet the power requirements of several hundred thousands people and will reduce 900,000 tonnes of CO2 emissions each year. Morocco’s national utility ONE is developing almost half of the planned projects while the other half is contributed by private investment through the “EnergiPro” initiative, which encourages industrial players to reduce their production costs by producing their own energy with projects up to 50 MW. As part of this initiative, ONE guarantees access to the national grid, and the purchase of any excess electricity produced at an incentive tariff, with different tariffs for each project. Tagged Ain Beni Mather, CSP, EnergiPro, Essaouira, MASEN, Morocco, Noor 1 CSP, Ouarzazate, Renewable Energy, solar, Solar Program, Solar Thermal, Tangier, Tangiers, Tarfaya, wind. Bookmark the permalink. Pingback: Morocco turn to renewable energy – Do I Have Anything to Say at All? Pingback: Morocco turns to renewable energy – Do I Have Anything to Say at All?